I never really had one of those “Daddy’s Girl” relationships, which is fine because I find them just a tad creepy. I like my family as a friend, thanks. A couple quick words about my dad. He’s responsible for just about everything I like except for Jethro Tull, Blondie and the Smiths. He introduced my sisters and I to Star Wars, Back to the Future, Steely Dan, Rodney Dangerfield, SNL. I watched MST3K on his TV. He let Hilary and I put up outer space wallpaper that still stands to this day. He never once said, “You are NOT leaving the house in that” (even in the full throes of my goth-girl phase) and never once punished me for ignoring my curfew, which I did all the time. 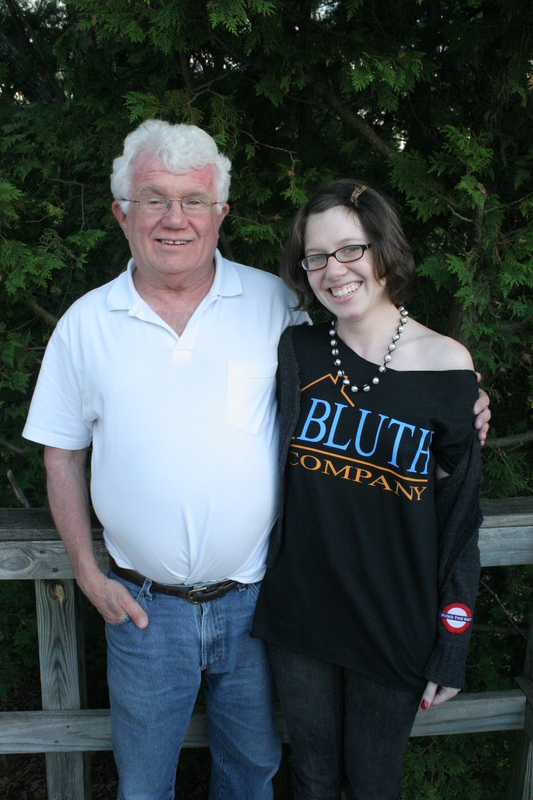 My dad is also responsible for showing me Arrested Development, which we have quoted at family gatherings every since. The day my grandmother Cora died, we gathered at home and watched “Good Grief.” We actually laughed, and I realized that everything was going to be all right. So for my birthday, he got me an official Bluth Development tee-shirt, a substantial upgrade from the “Save Our Bluths” tee-shirt that Hilary and I made with fabric markers and, later, stencils (mine had a seal on it and it read “I Went Swimming in the Ocean”). But one thing my dad has never been good at is guessing sizes. The shirt, while awesome, was way too big. It was comfy over leggings, though, which was fine because I rarely had time (or the weather) to actually wear a tee-shirt. But my dad, who works for FEMA, was finally home from his deployment, and we were going to have a BBQ. I was going to flatter my father, damn it, by wearing the tee-shirt he gave me, and it was going to look NICE. But in my haste, I misaligned the holes down the back. It was all looking terrible. I wanted to cry, fearing I’d ruined my awesome birthday Bluth tee-shirt. It was bad enough I had to admit not really loving the new season, but I couldn’t show up for Father’s Day not wearing the shirt my dad bought me. Arlene would be furious! I relaced it and tried again. It had a bit of a Flashdance vibe, but it worked. And my dad was happy to see me enjoying his gift. And my niece Lucy put on a pair of 3D glasses she found, trying to imitate her Aunt Libby. I mean, how much more flattered could a girl get?